No matter the time of year, you can take some time to be thankful. Certain people, certain things, or certain experiences can all inspire gratitude. We decided to take some time to think of reasons to be thankful for a swamp tour adventure in Louisiana. When you’re on vacation, it might seem like you’re just checking things off. There is so much information online. So many of your friends are eager to make recommendations. You compile a list and spend your trip dashing from one thing to another. The cliché of needing a vacation AFTER your vacation can apply. Focus on what you want out of each experience. Try to be in the moment instead of worrying about your itinerary. On paper or in your mind, list out reasons you’re glad to be there. Door-to-Dock Service. Nervous about navigating unfamiliar streets? Don’t feel like calling a cab? Find a swamp tour that will pick you up right at your hotel. You won’t be late because the boat won’t leave until your bus gets there! A REAL Louisiana Experience. Did you know one of Louisiana’s nicknames is “The Bayou State?” If you visit Louisiana without going to a bayou did you REALLY visit Louisiana? Of course, the restaurants, music, and culture all contribute to a fantastic vacation. But to round it out, a trip into the bayous is a must-do. Getting A Little Wild. No, we don’t mean the “wild” going on in the French Quarter. We mean wild as in … the WILD. Trees, animals, water. It’s a great escape from the noise of the city. You’ll see native Louisianians in their natural habitats. And we don’t only mean the tour guides (though they can be quite the characters themselves)! Relish the otherworldliness of cypress trees draped with Spanish moss. See if you can spot an alligator, a nutria, or maybe even a bald eagle! An Easy Ride. You might see many different boat options that do swamp and bayou tours. A slow-moving pontoon might be your best bet. It matches the pace of the bayou—bayou means “slow-moving stream” after all. You’ll have the time to take in the sights and snap some envy-worthy images. A ramp allows wheelchairs and strollers easy access. An Eco Education. We cannot overstate the importance of Louisiana’s ecosystem. A swamp tour is more than a fun diversion. It’s a look into what makes these areas vital for the state and the country. Tour guides tell stories about the swamp’s historical and economic importance. It may open your eyes and touch your heart. The Memories. The most important reason to be thankful. These days, more and more researchers are studying happiness. It turns out, people who invest in experiences are happier than those who buy things. Don’t consider it another tourist attraction. 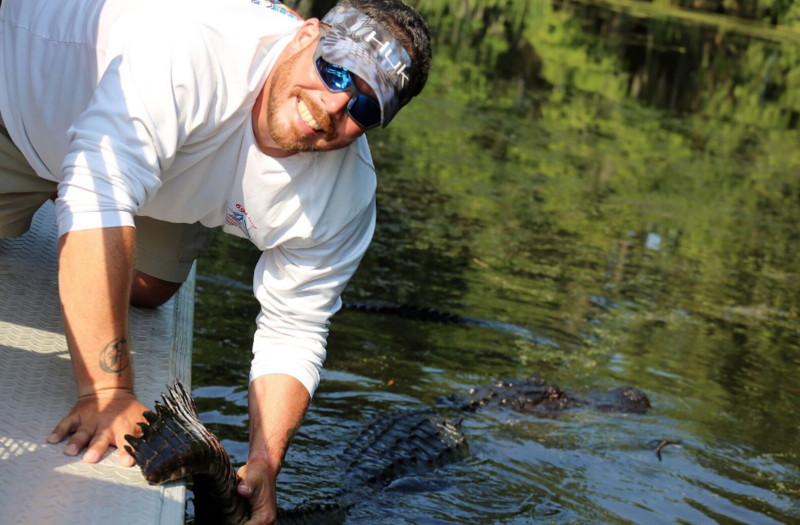 A swamp tour is an investment in your family’s future memories. 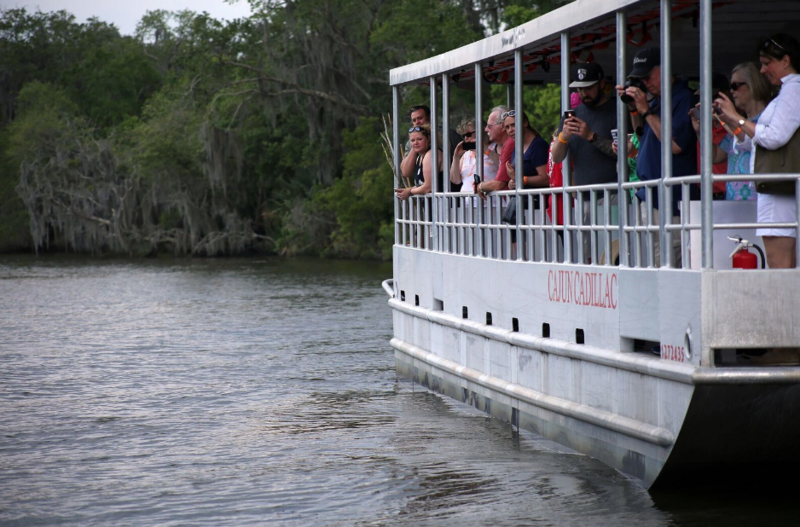 Whatever your reason for booking a swamp tour, choose Adventures of Jean Lafitte. Do you have questions? We’ve got answers. Booking couldn’t be easier. You can call us at 504-323-0570 or click here to book online. Come and make some memories with us. As for us, we’re thankful for visitors like you. We love having the opportunity to give you and your family a fun and unforgettable experience. Adventures of Jean Lafitte is more than just a bayou tour. It’s a true adventure. That means you’re going to want to bring the essentials of an adventure! What are those? We’re glad you (probably) asked! First, you’re going to want to dress appropriately for the weather. This is New Orleans, so 80% of the year that means you’re going to want to dress very lightly. It will be hot and humid. If you happen to be planning your adventure for the winter months, then it might be a good idea to dress a little more warmly. The point is, you’ll be exposed to the elements in your bayou tour. So, plan accordingly. Whatever you do, you don’t want the memories of this adventure to fade. Whether you take photos on your phone or you bring a camera, plan to capture a few moments. Whether you’re with your family, your spouse, your friends, or by yourself, you’ll want to capture photos of moss hanging low off cypress trees, beautiful bayou vistas, and rowdy alligators. You’re going to want to protect yourself from the water if that’s an issue for you. We sell ponchos and umbrellas in the gift store or you can bring your own. If you’re bringing your wallet, your phone, or your keys, you might consider putting them in a ziplock or something as well. Don’t get eaten or beaten. The bugs will eat you if you let them, and the sun will beat you up all day long if you don’t take proper measures to protect yourself. Otherwise, you’ll end up eaten or beaten by the end of the day. It’ll still be a good time, but why add that element of risk!? A bayou tour is a great time, but it DOES have bugs and sun. Don’t fall victim to either. Bring yourself, your friends and family, and your desire for fun. That’s the best way to ensure you have a good time. Of course, we’re going to do everything we can to ensure that you have a good time, too. With all of us working together, there should be good times had by all! After all, a bayou tour is a pretty fun adventure!